– roughly 40% of those emails are from the outside world (that is, not from colleagues at Google). – only 5% of my emails are from people who are actually on my team. – 3% of my current emails are about internal legal matters. – 1% are from public relations folks. – about 10-12% of those emails are about a couple recent internal projects that aren’t related to webspam but that I’m helping with. My 30 day goal this month is to get to a better place with email. Heck, I might make “better email habits” an ongoing 30 day challenge until things are in a better place. Could I get to a healthier place in three months? Four months? I have no idea how long it will take, but email represents my largest source of work stress. When I’ve tracked my time in the past, it takes me about three hours a day to keep from falling behind on email. If my whole day is full of meetings, then I’m spending several hours at night to keep my head above water. Does anybody else tackle email on their vacation so it’s not as bad when they get back? Some of you do, right? At 40% of my overall load, it’s clear to me that I have to do something different for emails from the outside world. For years I tried to answer everyone who emailed me. I’m going to have to go “lossy” and just let some of those emails drop. Rick Klau recently surfaced) that tries to address the common things that people email about. Then again, Rand Fishkin did something like that at http://moz.com/rand/making-email-more-scalable/ and he reported that he ended up with “a bunch of very angry people” when he pointed them to a blog post. So I’m not sure whether it’s better not to reply, or to write up a canned response or maybe a blog post or a flowchart that I can point people to. If you have tips that have worked for you to make email more manageable, let me know in the comments below. Added, 9/25/2013: This has been a tough challenge. One tactic that has worked well for me is to put email away from Friday evening until Sunday evening. Then (since I’m a workaholic), I ask myself “If someone else were trying to relax this weekend, what would I recommend for them to do?” and I try to do that. As a result, I’ve read more books this month, which has been nice. The other tactic is to allow myself to go lossy, which means not answering every email. A lot of emails require 5-15 minutes at a minimum to respond, so email becomes a todo list in which anyone can keep adding to the list. Treating any non-trivial email as if it’s a request for 10-15 minutes of my time has helped me figure out which emails I should respond to vs. not replying. John Mayer had a good post about a “digital cleanse.” The idea is to step away from the busy, buzzy world for a week. John mentioned four ideas, but I’m going to try just one: “no use of Twitter or any other social networking site”. Tweeted that I was doing the digital cleanse and changed my Bio line to mention that I was doing the digital cleanse. Removed all Twitter apps from my mobile phone. Removed the Twitter and FriendFeed shortcuts from Chrome’s new tab page. What these lines say is “Computer, when you try to use the domain name system (DNS) to resolve twitter.com to an IP address, hard-code the IP address to be 127.0.0.1.” Note that 127.0.0.1 is a special IP address that corresponds to your own computer. In essence, these entries make it impossible to browse to Twitter, Facebook, or FriendFeed. You might need to reboot your computer too for the settings to take effect. 1. Log in to http://feedburner.google.com/ and click on your blog’s feed. 2. 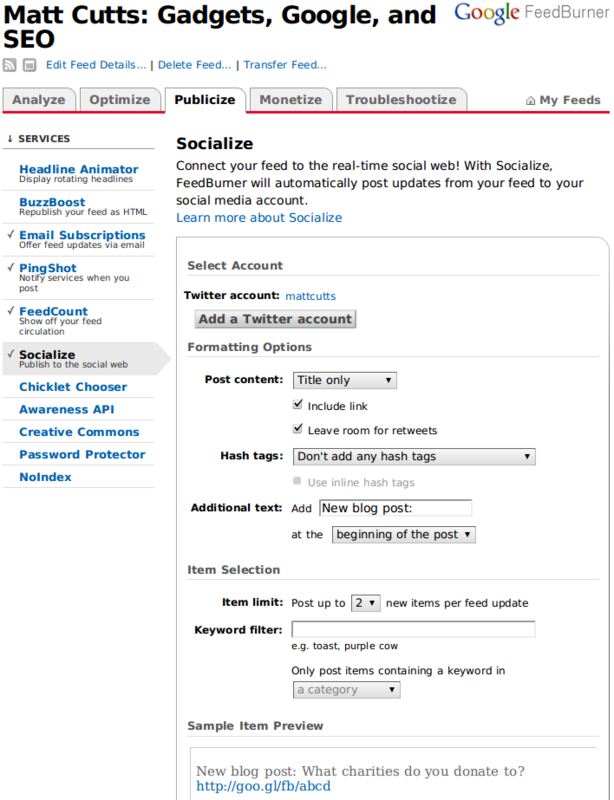 Click on the “Publicize” tab and then the “Socialize” service on the left. Then click “Save” and that’s all you need to do.